Personally, I like to get dinner on the table quickly, and I don’t like to clean up after myself. I feel I am not alone here. While some people fear that seafood is too extravagant, complicated or daunting, the truth is that few dinners are faster and easier than. “Spray sheet pan. Add fish. Cook.” Our home is focusing on healthier meals right now, so fish and vegetables are a common weeknight dinner. 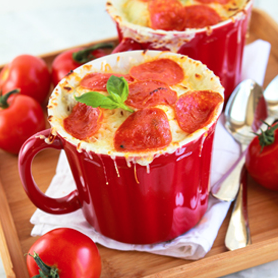 This is one of my personal go-to “non-recipes”. The protein may change. The vegetables may change, but the preparation and the technique are almost always the same. And you should always, simply cook to your desired doneness. 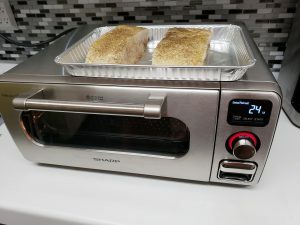 The SHARP Superheated Steam Countertop Oven makes it easy to get dinner from the kitchen to the table without any fuss. The fact that the oven is “Instant On. No Preheat, No Defrost” is great. It is also flexible. You COULD preheat it if you want. Sometimes I do. This is going to be quick. Preheat the oven if you like. I sometimes set it to Bake/Roast, 485°F, 60 min and just let it run while I prepare the rest. Put all of the vegetables into a mixing bowl that much larger than you think it needs to be. Add Salt and Pepper to taste. This amount of vegetable could take 1 tbsp. of salt and 2 tbsp. coarse ground black pepper, but it is up to you.This is where you can take advantage of a little life-hack. You’re adding salt, right? You know what else is salty? Chicken base or chicken bouillon powder. 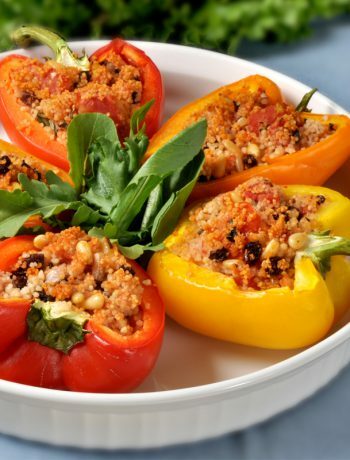 You can use it instead of plain salt to add tremendous depth of flavor and it will combine with the juices from the vegetables to create a light and savory sauce at the same time. I use this trick a lot. I used to use a bouillon cube and a micro-plane grater, but eventually I bought powdered chicken base and added it to a shaker. I would never use it on Chilean Sea Bass, but on cheaper, less flavorful fish like striped bass or tilapia, it helps. Add enough olive oil to coat – at least 3 tbsp. Mix thoroughly with a large spoon or spatula while turning the bowl. 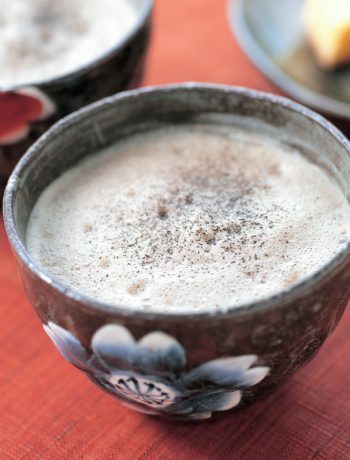 In about 4 or 5 turns, you should find that everything is coated evenly (pay attention to the black pepper. If that looks evenly distributed, everything else is, too.) When you are working quickly, you will appreciate having the larger bowl. 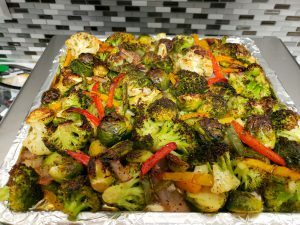 Line the Broiling Pan with aluminum foil (or don’t) and add the vegetables. I like to distribute them evenly. Put in the Superheated Steam Countertop Oven and cook to your desired doneness. I like to see and taste a little char on my vegetables, so I don’t open the door until I know they have begun to caramelize. Then I leave them for another few minutes. 1.Spray a 1/4 Sheet Foil Pan with non-stick spray. 2. Season the filets with salt and pepper on the white side, then mist / spray with a light coating of olive oil. Do the same on the skin side. This looks minimal, but there is a lot of thought in this step. First, fish is expensive. If you are paying for fresh fish, you should taste it. Salt and pepper is all that is necessary to season the food while preserving the quality. Second, we add the salt first… Two reasons. Salt should melt. When you put salt on the filets, it will interact with the moisture on the fish and begin to dissolve evenly. If you add olive oil first, you are actually creating a waterproof barrier between the fish and the salt – so it never has the chance to do its job properly. The other reason to add salt first is because it may help minimize the albumin. Albumin is the white protein that arises and congeals on the surface of cooked fish. It is easiest to see it on darker fish like salmon and tuna. Albumin is basically in all fish, all the time. It is completely harmless. It is just protein. One could argue that it is good for you. But most people have a problem with it visually and would rather not see it. A sprinkle of salt treats the surface of the fish and makes it less likely that the albumin would rise to the surface. Personally, I don’t care. It never bothered me and I never thought twice about it. But it’s a thing for some people. Black pepper, on the other hand gets its flavor and spiciness from piperine (not capsacin) which can dissolve in oil (and water somewhat). So it is effective on either side of the olive oil barrier, but most flavorful beneath it. 3. Place the filets on the tray skin side up and cook to your desired doneness. This is a matter of personal preference. 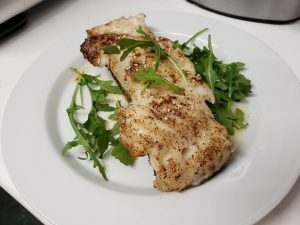 One school of thought says that most fish should be almost completely raw, but warm in the middle and have the feel and texture of just-set custard. I am not completely dedicated to this idea. I agree when it comes to salmon or tuna. Even “tuna-adjacent” fish like amberjack, hamachi and pompano work well like this. But Chilean Sea Bass, in my opinion needs to be cooked through. It is very fatty and can be a bit stringy when undercooked. 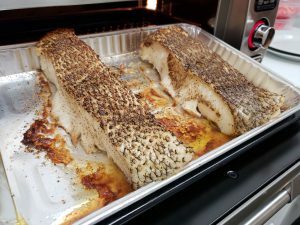 A good rule of thumb for cooking many types of fish is to observe “venting.” Once you can see that the flakes of meat have started to pull away from each other, often in a row like the louvers on an air conditioning vent, you are probably ready to eat. Cooking skin-side up is important here. Sure you COULD cook it skin-side down, but it will just get soggy and you will be missing out on an important element of flavor. The skin contains the most buttery flavors. Cooking it skin-side up allows the fat to render down and baste the fish in buttery, umami goodness the likes of which no other fish can compare. Salmon? Turn on Discovery Channel for 10 minutes, even grizzly bears pull the skin off salmon. 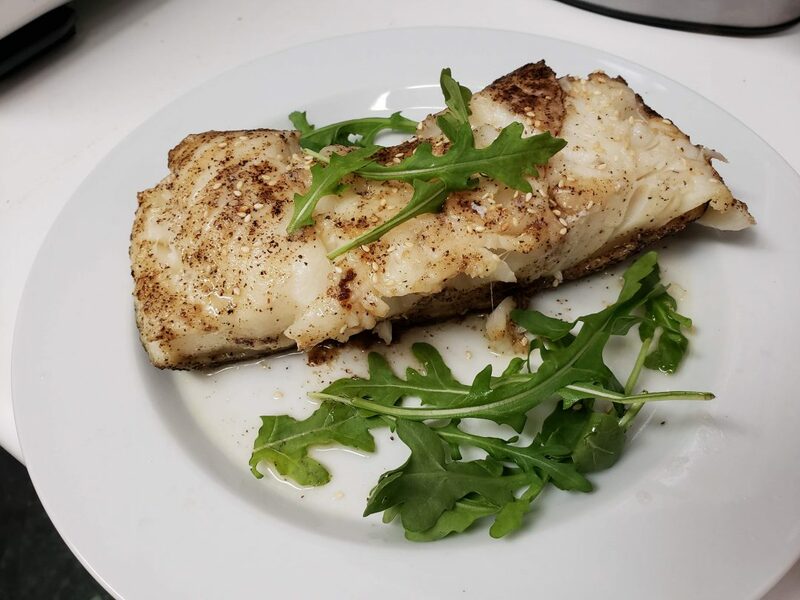 Chilean Sea Bass skin is a delicacy. 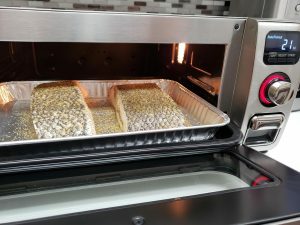 When I feel the fish is close-to-done… maybe it just started venting, I cancel the remaining time and switch to Broil/Grill and move to the top-rack for another couple of minutes to let the skin get nice and crispy. Look through the window of the oven, you should see the fat bubbling on the surface as if it were in a deep fryer. Personally, I can only have a few bites of the skin. It is extremely rich, much richer than fried chicken skin. 4. Transfer the finished filets to the plate and serve with some fresh arugula and a sprinkle of sesame seeds. If you want to marry flavors, you can add the vegetable to the plate, but I prefer it on the side. Hello and welcome home to Simply Better Living! I’m Gina, and I enjoy sharing mindful recipes and lifestyle tips to encourage others to live a simply better life. Of the things I enjoy most, food, traveling, and my family certainly take precedent as the top 3. My goal is to show readers (like you) that eating and living consciously does not have to be a challenge. Believe it or not, it can, in fact, be an enjoyable experience even after a long day at work. Thank you for visiting Simply Better Living. I look forward to sharing more with you!